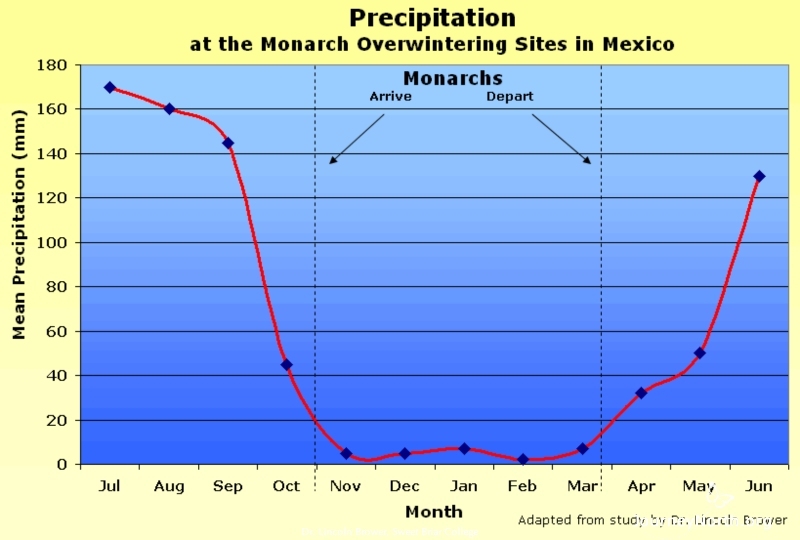 Monarchs, Mountains and Moisture by Dr. Lincoln Brower Moisture is crucial for the monarchs' overwintering success in Mexico. I hypothesize that one of the reasons the butterflies choose to overwinter where they do is because the high altitude mountains capture moisture. The pictures in this slideshow tell the story. 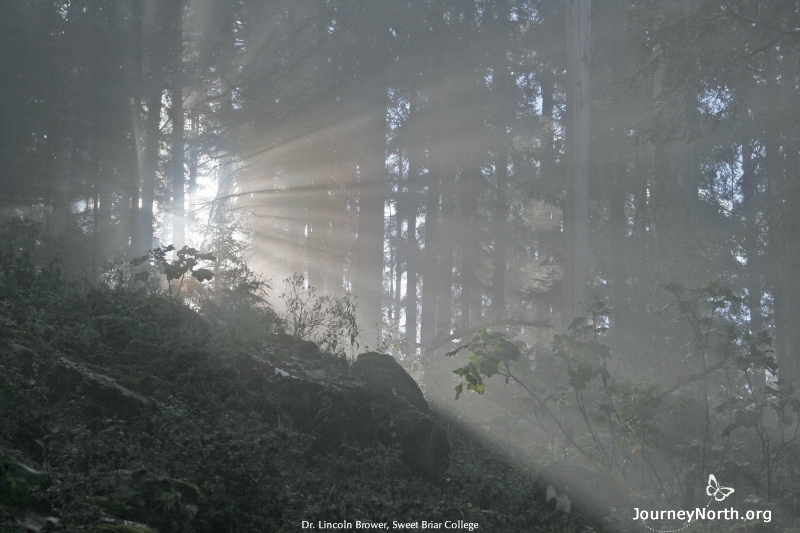 I took this picture early in the morning, as the clouds were forming and blowing through the butterfly colony. The colony is just outside of the image, to the left. 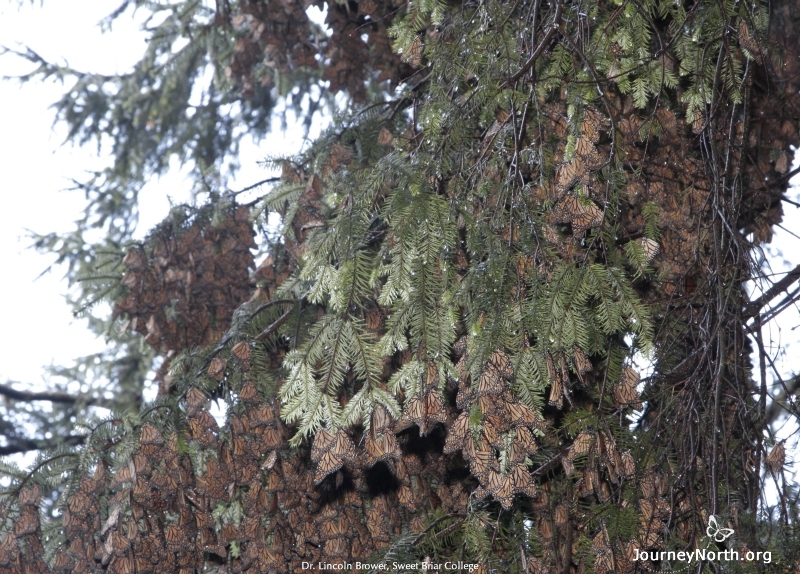 Morning Mist Early in the morning, the mist is engulfing the butterflies and condensing on the Oyamel fir trees. 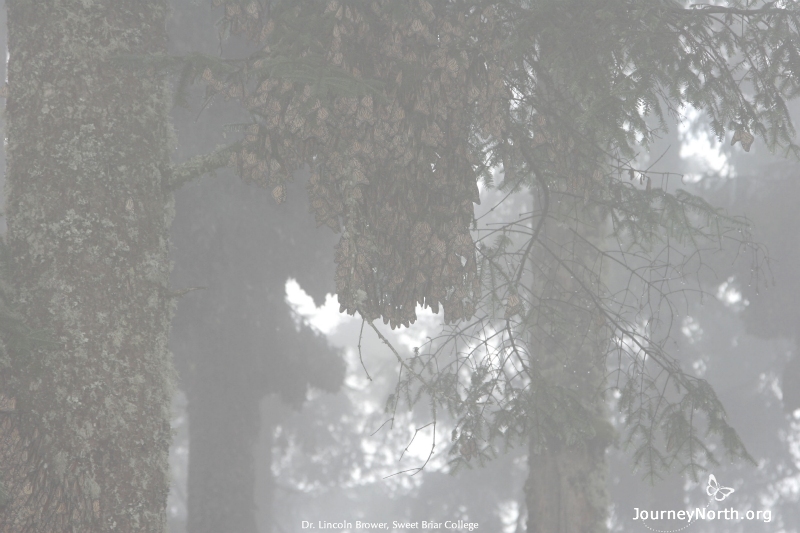 Inside the Colony Clusters of monarchs on the Oyamels are enshrouded in mist. Mist to Frost Taken early in the morning on 11 December 2006, this picture shows how the condensed mist freezes on the magnificent open area on Cerro Pelon, known as the Llanos de los Tres Goberonores. In this picture, you cannot see the colony, but it is all the way down at the end, to the right, in a grove of cedar trees. Frost to Dew Later in the morning, in the same area, we found several thousand monarchs drinking dew. 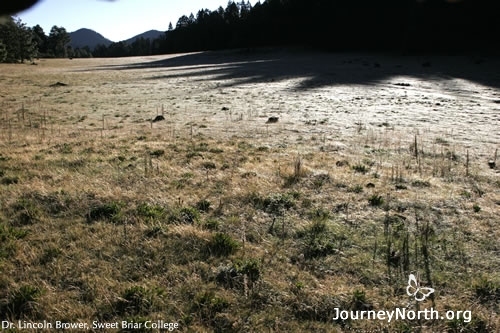 The sun's rays had fallen on the frosted ground vegetation and the frost had melted into dew. 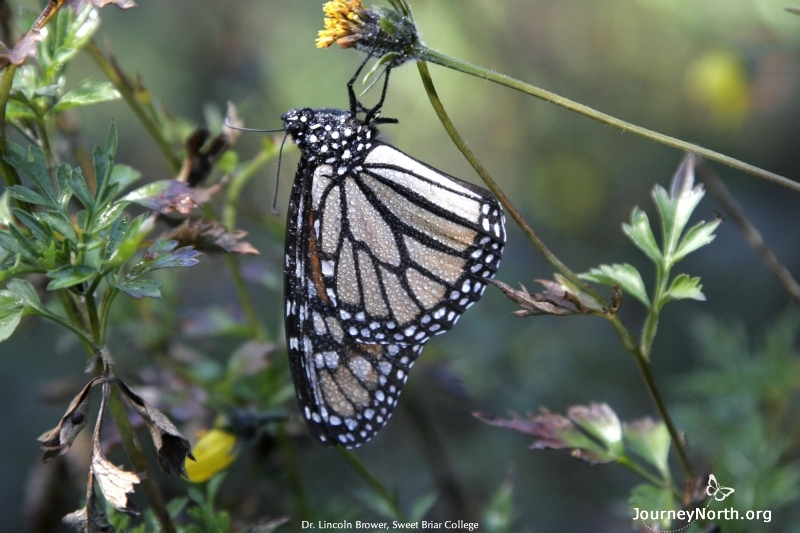 The monarchs flew out of the overwintering colony to drink the dew drops. Drinking Dew This monarch’s proboscis is in the grass, imbibing the dew. Water on Wings This monarch failed to fly back into the clusters before nightfall. Water droplets condensed on its wings. This is a very precarious situation. The dew can freeze when the overnight temperature drop below freezing. This often happens in open areas that are exposed to the cold, clear sky. Killed by Frost Crystals This butterfly is a victim of a freezing event and will not survive. 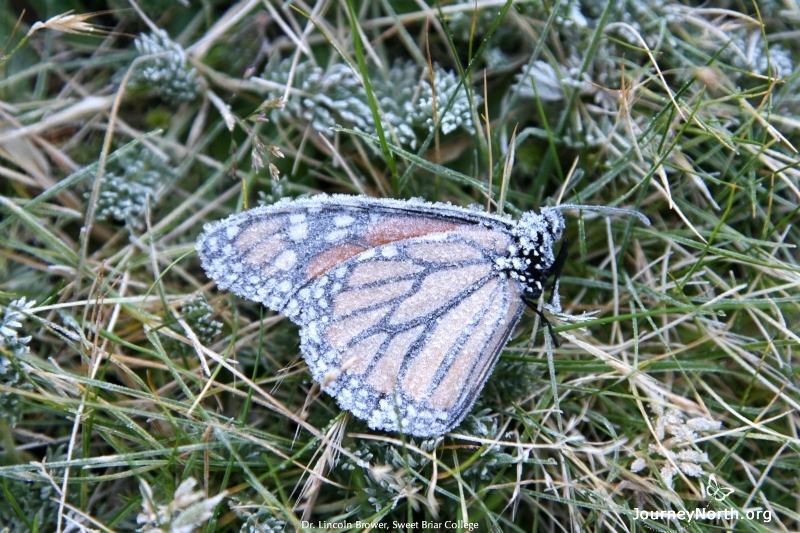 The frost crystals mortally wounded the butterfly. They penetrated through the cuticle and disrupted the cells. 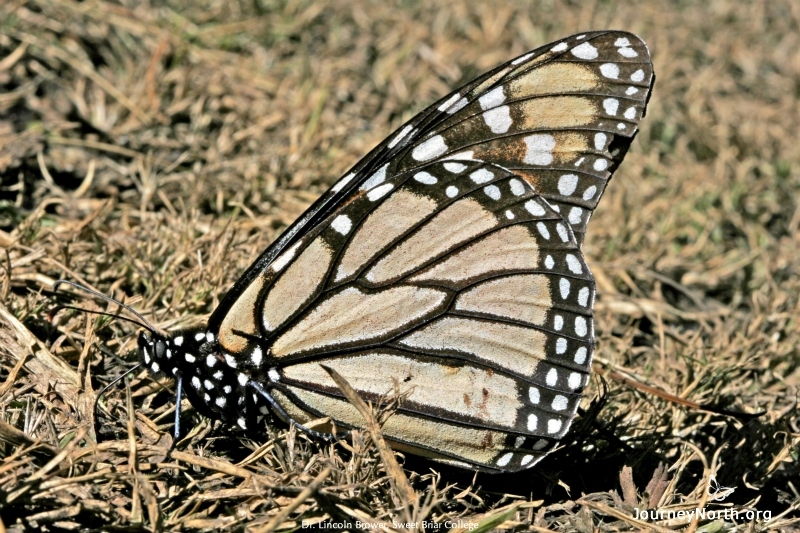 Although millions of monarchs may fly out of the colony on sunny days to find water to drink, almost all of them manage to fly back into their colonies. Only a few get stranded in open areas where they may freeze to death. Mountains Capture Moisture The high altitude mountains capture moisture through a process called adiabatic condensation. As moisture-laden air rises, it expands and cools, then clouds form. 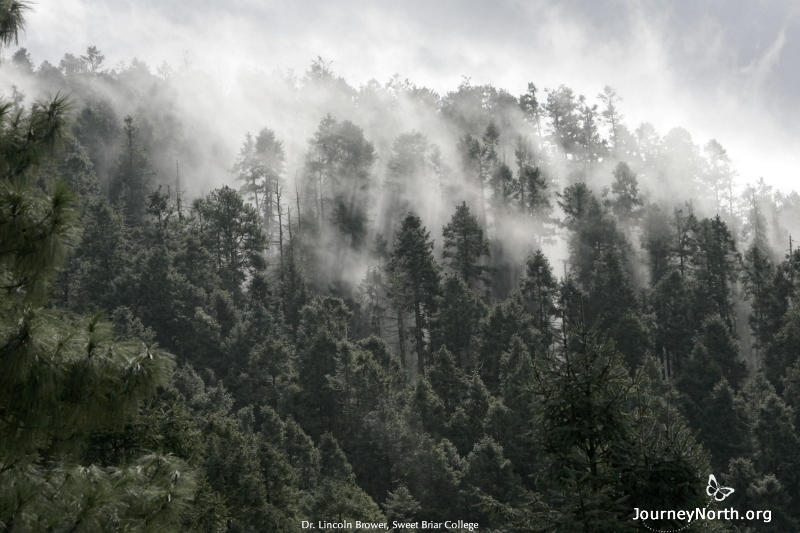 At the high altitudes, the moisture condenses as water droplets on the needles of the Oyamels and pines. Mist on Monarchs You can see droplets of condensed mist on both the pine needles and on the butterflies. 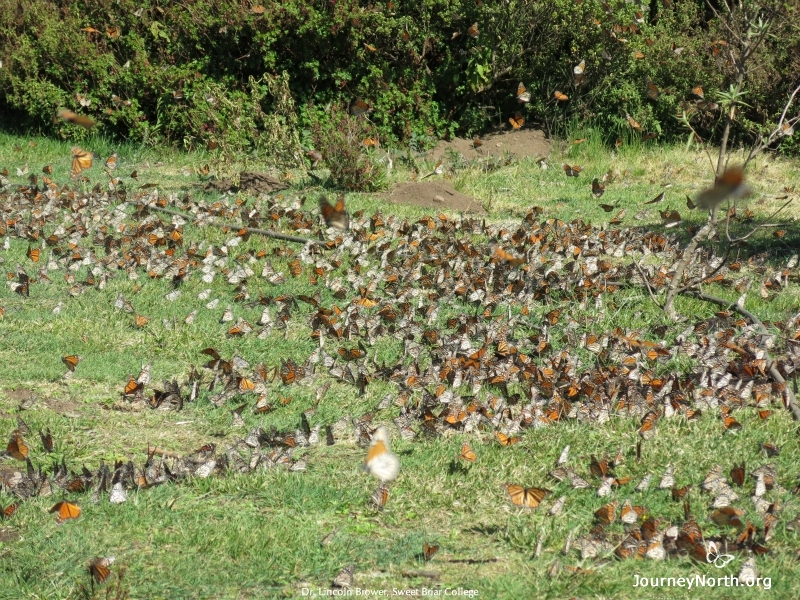 Overwintering During the Dry Season Mexico's dry season begins when the monarchs arrive in November and lasts until they leave in March. 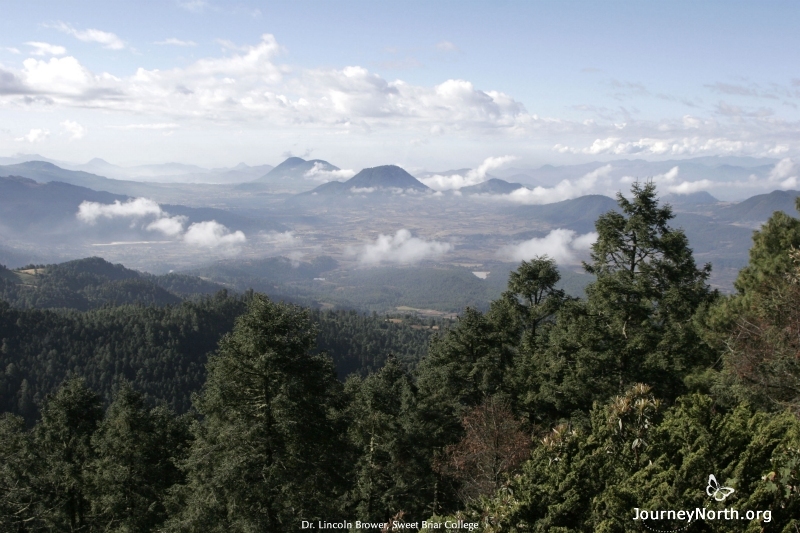 The air becomes increasingly dry as the months go by, drying out the forest and the butterflies. Even dew becomes scarce. Colony Break-up By March, the monarch's winter habitat is extremely dry. 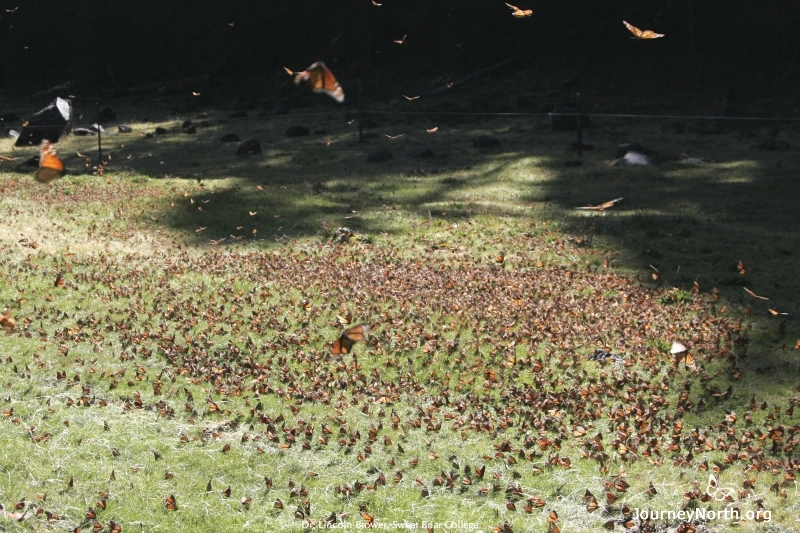 The colonies break up as the butterflies fly out in search of water. They move down the mountain into the lower portions of the watersheds. It’s important to protect the entire watershed so monarchs can find moisture during the final critical weeks before spring migration. 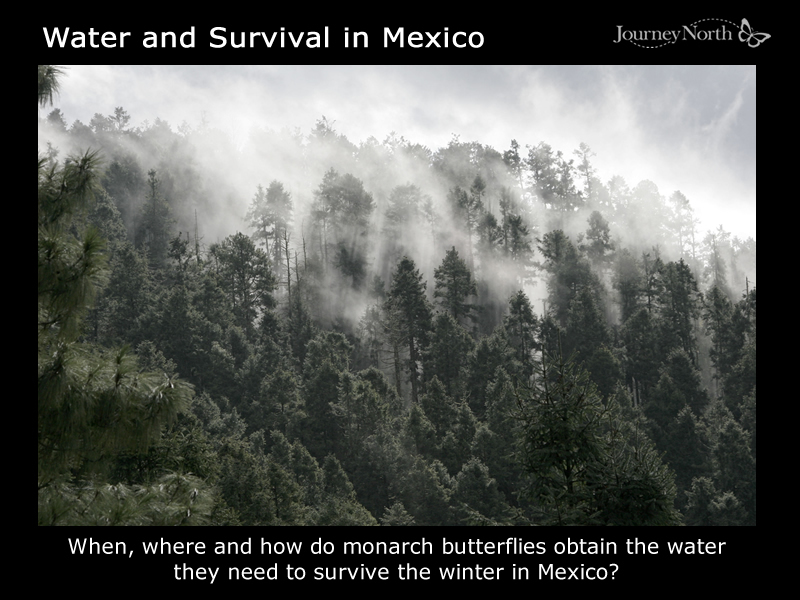 When, where and how do monarchs obtain the water they need to survive the winter in Mexico?